King Dashratha is overwhelmed by the feats of Rama and decides to crown him the future king of Ayodhya. Kaikeye, Dashrath's beloved wife takes offence to his decision as her mind had been poisoned by Manthara, her crooked maid. 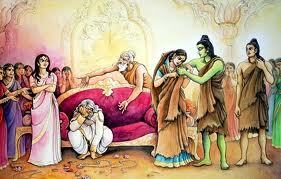 She wants fourteen years of exile for Rama and Bharata, her son, to become the king of Ayodhya. Bharata had gone to visit his grandparents and was not aware of these developments. Dashratha is shattered. When he asked Kaikeye to rethink, she reminded him of his promise to fulfil her two wishes.